Sir Alexander Cunningham, the first director general of the Archaeological Survey of India, has contributed a lot to the Indian archaeology. His work on epigraphy and Buddhist monuments are noteworthy. Although Moen jo Daro was not discovered during his lifetime, but his observations on Buddhist history and the history of the Indian writing are of great value for the understanding of the Harappan or the Indus Civilization. Cunningham had identified many common features between Buddhism, Brahmanism and the ancient western traditions of the Druids and he believed in a more ancient Buddhism which prevailed not only in India but in several other parts of the world. His book “Bhilsa Topes or Buddhist Monuments of Central India” published in 1854 is not only an account of Buddhist monastic complexes but it is a history of Buddhism. Years after writing the book when he arrived in the land of the Yusafzai tribals near Peshawar, he identified Shahbazgarhi with Po-Lu-Sha, recorded by Xuanzang (Hiuen Tsang), the Chinese pilgrim who in mid seventh century had visited India and listed hundreds of Buddhist places. Northwest of India, which is now Pakistan, had been a land of Buddhism. Shahbazgarhi is still marked with a rock engraved with the edicts of the Buddhist King Asoka Maurya (273-232 BCE). In Cunningham’s words, “The great inscription of Asoka is engraved on a large shapeless mass of trap rock, lying about 80 feet up the slope of the hill, with its western face looking downwards towards the village of Shahbaz-garhi.” The edicts, preaching the principles of Asoka’s Dhamma policy, were engraved on rocks and pillars throughout his empire. Asoka declared that he has got them written on the rocks so that they endure longer and the future generations can see them. Also, they are written in the vernacular dialects of their location so that the ordinary people can understand them. Asoka’s edicts give a good insight in the social and moral code that the good king gave to his people but they are also valuable specimens of the earliest known scripts of the Indian subcontinent. Hence, Cunningham’s book on the inscriptions of Asoka is very important for the understanding of the history of Indian writing. While referring to the Shahbazgarhi inscriptions he writes, “The inscriptions of Asoka are engraved in two distinct characters, one reading from right to left, which is confined to the Shahbazgarhi …and the other reading from left to right.” Later, the Shahbazgarhi script was labeled Kharoshti and the script used for Asoka’s edicts elsewhere came to be recognized as Brahmi. In 1896, Georg Buhler while identifying the four varieties of Kharoshti, considered the Shahbazgarhi and Mansehra rock edicts (also in Pakistan) inscribed with the oldest variety of Kharoshti. Structurally Kharoshti and Brahmi are similar but Brahmi, originally used for Buddhist scriptures, became more widespread as it came to be used for a variety of Prakrits or the vernacular dialects. Cunningham had rejected any influence of the hieroglyphs and the cuneiform system of the west on the Indian writing and was inquisitive about the origins of this indigenous script. He was aware that the ancient sites were not thoroughly explored and the older specimens were yet to be recovered, the only evidence of an earlier version of Shahbazgarhi writing he could think of was engraved on a tiny steatite seal “…I have , however, come across one monument which I believe to be a specimen of the archaic alphabetical writing. Its age is, of course, quite uncertain, but I do not think its date can be later than 500-400 B.C. This monument is a seal of smooth black stone, which was found by major Clark in the ruins of Harapa in the Panjab.” This was the only Indus seal unearthed during Cunningham’s times and yet his observation, based on a single seal, has turned out to be most logical. His idea that the Harappa seal script was a predecessor of the earliest known script of India is not fully lost. Though Kharoshti is sidelined and most of the research after him is focused on the more known Brahmi and its links with the Indus script. The largest number of seals, about 1200, were unearthed from the ruins of Moen jo Daro. Most of these had the format of the Harappa seal- a row of signs engraved above the image of an animal facing an unidentified object. The signs are considered to be an ancient script and like Shahbazgarhi inscriptions these too run from right to left. Some of the seals are also engraved with the symbols of Buddha. Towards the end of the urban phase, narrative seals were made, they seem to represent events and can very well be the precursors of Jatakas, which are engraved with stories of Buddha’s birth. Marshall’s observation of a narrative seal from Moen jo Daro, depicting seven female devotees facing a deity standing in the ‘pipal tree’ is revealing. According to him “This is the tree of knowledge (Bodhi or bo-tree) under which Buddha gained enlightenment.” Another seal depicting a ‘proto-Shiva’ image with two deer images under his ‘throne’ reminded Marshall of the deer motif in Buddhist imagery symbolizing the Deer Park where Buddha gave his first sermon. He also saw semblance between the floor pattern of the Pillared Hall and the Buddhist monasteries where the monks seated themselves on low benches. The Priest King, draped in a shawl with his right shoulder exposed, may have even reminded him of the Buddhist monks attired in the same fashion. There is more of this scattered in John Marhall’s three volumes of “Mohenjo Daro and the Indus Civilization.” These pieces of evidence would have been enough for Cunningham to trace the roots of his ‘ancient Buddhism’ in the Indus Civilization, but this is not what the new generation of archaeologists thought. Moen jo Daro’s ruins are still crowned with a fragment of the stupa wall but this symbolism has always been ignored. Twenty first century, however, has begun with some hope as Giovanni Verardi of Naples University, Italy has casted doubts on the dating of the ‘so called stupa.’ Cunningham, through Buddhist scriptures had already surmised that stupas were existing before the advent of Buddha and people revered them, in fact, Buddha considered the ancient sages as his immediate predecessors. Buddha came to be represented in human image during the Kushan period, prior to that he was represented by symbols and the stupa image was one of the symbols. Kirthar mountain ranges between Sindh and Balochistan are engraved significantly with the images of stupas and several other auspicious Buddhist symbols. This is yet another evidence suggesting the existence of an early Buddhism in the Indus region, therefore, it is very likely that Moen jo Daro stupa is a relic of a much earlier period. Michael Jansen of the the University of Aachen, Germany feels that it may not be of Kushan origin but might be Harappan. We have to bear in mind though, that we cannot expect Buddhism to appear in its conventional sense in the Indus civilization but We can safely assume a peaceful way of life prevalent in the Indus Civilization. To label this non-violent characteristic of ancient Indus a philosophy, an ideology or a religion will be inappropriate because the civilization at that moment of socio-cultural evolution was at a stage where philosophy, ideology and religion were all rolled together. It was only in later times that the nonviolent traits of the region came to be defined with different labels-Buddhism, Jainism, Hinduism, Gandhism and Sufism. You can buy it from Amazon – click here. The title is Moen jo Daro: Metropolis of the Indus Civilization (2600-1900) BCE). The text is interspersed with the original images specially photographed for this book by Pakistan’s well-known photographer Amean J. It is also enhanced by the artwork of internationally known artist Laila Shahzada. The book is reviewed by Dr. Subhash Kak, Regents Professor Oklahoma State University and Dr. Shoukat Shoro, the former Director of the Institute of Sindhology, Jamshoro Pakistan. The idea of writing a book on Moen jo Daro for general readers was given to me by Dr. N.A. Baloch. At the same time he suggested that it should not be a handbook of the site but a work presenting Moen jo Daro in a wider historical and geographical context of the Indus region; it should inspire the future generations to seek clues in the languages, legends and folktales of Sindh, Balcohistan, Rajasthan, Kutch, Gujrat, Punjab and beyond. Later on he wrote the foreword of the book. Indus civilization was spread over a vast area and archaeology allows crossing political boundaries; hence, I approached Dr. Vasant Shinde to write a second foreword of the book. Dr. Shinde is working on the Harappan sites discovered in the Indian Punjab and he is also the vice chancellor of the prestigious Deccan College deemed University. His foreword is most befitting as Moen jo Daro symbolizes the common heritage and history of Pakistan and India. 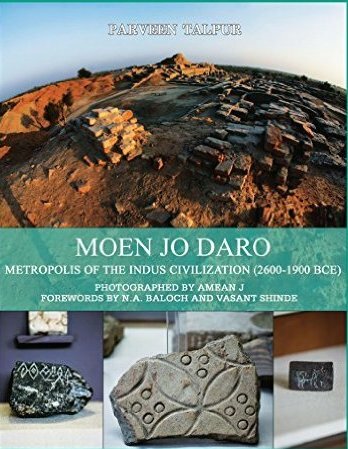 Moen jo Daro: Metropolis of the Indus Civilization (2600-1900) BCE) is now available on Amazon.com for purchase – Click here. It is a personal view book and is divided in nine chapters, below is a brief description of these chapters. The first chapter is about myths and legends thriving in the Indus region. Due to lack of direct references to Moen jo Daro legends can become one of the valuable sources of information. The chapter demonstrates how some of these can hold important clues for the understanding of Moen jo Daro and Indus Civilization. The second chapter is about the Mound of Dead which is the English translation of Moen jo Daro. The Mound was crowned with the remains of a Buddhist stupa which led to the discovery of this ancient city. The chapter gives the history of the discovery of the stupa which was actually the major attraction for British officials. It also provides the background information on the Buddhist period and Buddhism in Sindh. The third chapter describes the layout of the two parts of the city. It also lists the artifacts discovered from its ruins. Most of these are showcased at the site museum of Moen jo Daro and the National Museum, Karachi. With the exception of a few, the photographs of the architectural remains and the artifacts are by Amean J. Chapter four describes the geographical extent of the Indus Civilization as well as its origins, its nature and its decline. Beginning from the Neolithic agrarian communities of Balochistan, it traces their socio-cultural evolution to a mature urban phase that bloomed in the Indus Valley. Moen jo Daro in this chapter is examined in the larger context of the Civilization. Chapter five is an attempt to reconstruct the picture of the inhabitants and their life in Moen jo Daro and Indus Valley. It also refers to the views of various archaeologists and how their reconstructed pictures differ from each other according to their orientation and generation. Chapter six describes the ideology of the ancient Indus society as reconstructed through a variety of evidence gathered from Moen jo Daro and a few other significant Indus sites. The chapter sheds some light on the possible links between the ancient Indus ideology and the later Hindu, Buddhist, and Jain religions. It also examines the status of women and the role of mother goddesses in those remote times. Chapter seven deals with the most striking finds – the enigmatic signs and symbols engraved on tiny steatite seals. It gives a history of their decipherment and the hurdles in research. In this chapter I also share my research on the signs and symbols engraved on the seals. Chapter eight explores the reasons of the ‘sudden collapse’ of the urban phase of Indus Civilization. Beginning with the Aryan invasion theory and its rejection, it highlights a few other sites to explain a gradual deterioration of the urban centers and an eastward migration to Gujarat. Chapter nine gives the background of the international campaign of saving Moen jo Daro from the threats of water logging and salinity. It includes the preservation measures recommended by Pakistani officials and experts from UNESCO member countries. In this chapter I also appeal to the readers to join me in my campaign calling for the three-dimensional digital preservation of Moen jo Daro. You can also see a related blog here.